Michael Connelly’s first novel The Black Echo came out in 1992, and I became an instant fan. I grew up in Southern California, which is Connelly’s beat. I saw him at a writer’s conference in Manhattan a few years ago, and he acknowledged Raymond Chandler and Robert Towne (writer of the superb film Chinatown) as major influences. Like Chandler and Towne, Connelly makes integral use of Los Angeles and surrounding areas. The locations figure as settings and at times, characters. Just today, I finished Bosch Season 4 on Amazon. Ten episodes, about 50 minutes each. Wow, it’s the best season yet. The writing is top notch. Smart and topical, not dumbed-down. No clichés or aimless sensation. It’s straight-ahead investigative drama that’s confident it has a story to tell. Michael Connelly doesn’t usually write the scripts themselves, but he co-wrote episode 9, and for various reasons, it shows. Each episode ends in a cliffhanger, and there are several twists and shockers. Harry finally solves the 40-yr-old murder of his mother, which ties in to the current murder of a well-known African American defense attorney who became an anti-racism activist right before his death. There’s even a sub-plot about Chinese gangs and money-laundering. Because it involves Harry’s ex-wife, this part feels relevant, not like a violation of the show’s overall unity. I enjoyed the superb location shooting, which carries on the Los Angeles tradition of Raymond Chandler. Within the first few minutes of Episode 1, we’re at the Biltmore Hotel, the Bradbury Building and Angels Flight. The show makes great use of the city, from the L.A. River to Baldwin Hills, San Gabriel, and local burrito trucks. There are also contemplative sunset moments in the vast desert around Borrego Springs down by the Salton Sea. This non-urban detail links the L.A. detective story to the Western, another great genre set in the same part of the United States. There is even a surprise location, but you have to wait until later in the show to discover it. It’s a generous show, by which I mean the supporting characters get their time in the sun. Bosch is clearly the lead, but everyone on his team contributes essential details to the cases. 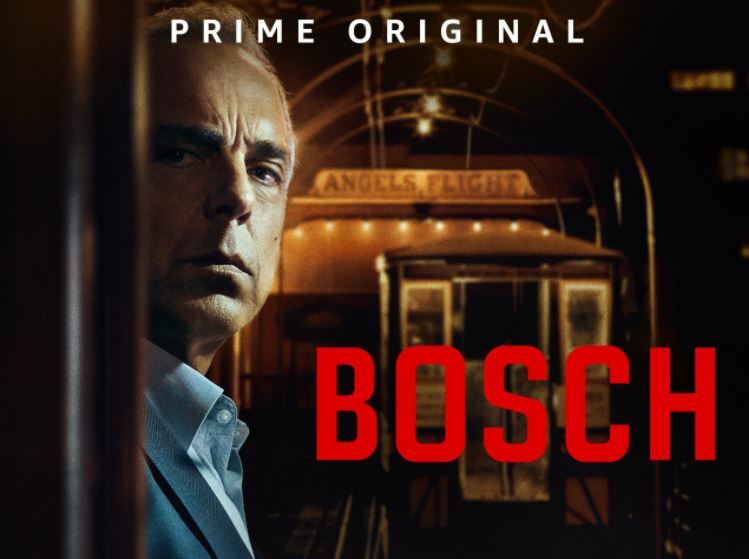 Bosch is not the best communicator, so his partner Jerry Edgar (Jamie Hector) learns how to work with greater independence while recovering from a bullet wound. Their section commander is the tough and humane Acting Cpt. Grace Billets (Amy Aquino). All the cops wish they could have a boss like her. The chief presiding over all their work is the cold, commanding but honest Chief Irving (Lance Reddick). Even the old-school homicide cops “Crate & Barrel” (detectives Johnson and Moore) aren’t there just for comic relief – they actually solve a cold case. Bosch’s daughter Maddy (Madison Lintz) is a senior in high school but displays some shrewd independent investigative work of her own. In the books, she mentions wanting to become a detective herself one day. Good investigative drama is rare. But investigation is the heart of Bosch. The show is at its most gripping when Harry is by himself looking for something. Those are quiet moments but wonderfully tense, because we just know he’s going to find something groundbreaking. This is dramatic television at its very best. I can’t wait for Season 5!